Want to become a millionaire? Then perhaps you should start by studying the behaviors of people who have done it. Check out the lists of the best financial books of all time, and you're bound to find several that include The Millionaire Next Door: Surprising Secrets of America's Wealthy. Written in 1996 by marketing professors William Danko and Thomas Stanley, its main premise is that people who look rich may not actually be rich; they overspend — often on symbols of wealth — but actually have modest portfolios and, sometimes, big debts. On the other hand, actual millionaires tend to live in middle-income neighborhoods, drive economical cars, wear simple watches, and buy suits off the rack. You've likely heard of the book. You may be familiar with the premise. Perhaps you even read it way back when. But if you read it again — as I recently have — you'll be reminded of some of true gems of wisdom Danko and Stanley gleaned from their thousands of surveys of millionaires. Yes, higher-income households tend to have more wealth than lower- and middle-income households. But the size of a paycheck explains only approximately 30% of the variation of wealth among households. What really matters is how much of the income is invested. On average, millionaires invest nearly 20% of their income. Multiply your age times your realized pretax annual household income from all sources except inheritances. Divide by 10. This, less any inherited wealth, is what your net worth should be. The authors rightly call it a “simple rule of thumb”; a more thorough analysis would look at lifetime income, not just the most recent year. Plus, it strikes me that it's more accurate for people who are at least a couple of decades into their careers. It's not realistic, for example, to think a 25-year-old who makes $30,000 would have accumulated $75,000 (25 x 30,000 Ã· 10). However, for those in their mid-40s and later to meet this metric, they would have needed to save 10% to 15% of their incomes throughout their careers, or started later but saved 20% to 25% of their incomes. That's not common, but also not impossible. The formula also helps in sorting out the millionaires-to-be and the millionaire-wannabes. Those in the top quartile of wealth accumulation are prodigious accumulators of wealth (PAWs), according to Danko and Stanley. Those in the bottom quartile are under accumulators of wealth (UAWs). The majority of millionaires have a budget. Of those who don't, they have what the authors called “an artificial economic environment of scarcity,” more commonly known as “pay yourself first.” In other words, they invest a good chunk of their income before they can spend any of it. Similar to the previous point, almost two-thirds of millionaires can answer “yes” to this question: “Do you know how much your family spends each year for food, clothing, and shelter?” In contrast, only 35% of high-income non-millionaires answered yes to this question. Millionaires are more likely to track their spending. Another two-thirds of millionaires answered in the affirmative to this question: “Do you have a clearly defined set of daily, weekly, monthly, annual, and lifetime goals?” One example: a woman who wants to have $5 million by the age of 65, at which point she'll retire. At the time of the book's publication, she had already reached millionaire status — on an annual income of $90,000. As for those who answered “no” to the question, many of them are retired and have already reached their goal of financial independence. Your choice of home — and how often you choose a new one — will determine your ability to accumulate wealth. According to The Millionaire Next Door, that wealthy family has been next door for quite a while. Half of millionaires have lived in the same house for more than 20 years. Nothing has a greater impact on your wealth and your consumption than your choices of house and neighborhood. If you live in a high-price home in an exclusive community, you will spend more than you should and your ability to save and build wealth will be compromised…. [P]eople who live in million-dollar homes are not millionaires. They may be high-income producers but, by trying to emulate glittering rich millionaires, they are living a treadmill existence. Ninety percent of millionaires live in homes valued below $1 million; 28.3% live in homes valued at $300,000 or less. On average, millionaires have a mortgage that is less than one-third of the value of their homes. If you really want to reduce your housing bill, join the 67,000 millionaires who live in mobile homes. The majority of wealthy people are married and stay married to the same person. Of course, marriage shouldn't be just about money. We're sure that 24-year-old Crystal Harris has other reasons for being engaged to 84-year-old Hugh Hefner; perhaps she loves his pipe. But several studies have shown that people who are married accumulate more wealth than those who are single or divorced. The majority of millionaires own their cars, rather than lease. Approximately a quarter have a current-year model, but another quarter drive a car that is four years old or older. More than a third tend to buy used vehicles. What is the most popular car maker among millionaires, according to Stop Acting Rich? Toyota. So who's driving all those BMWs and Mercedes-es? Not millionaires. Eighty-six percent of “prestige/luxury” cars are bought by non-millionaires. In fact, Stanley writes that “one in three people who traded in their old car for a new one were upside down and owed more on the trade-in than its market value.” It's tough to get wealthy doing stuff like that. First of all, PAWs worry less than UAWs. There's a peace of mind that comes from living below your means and having money in the bank. But they also don't expect “status” purchases to improve their happiness, because evidence shows it doesn't happen. Among the people surveyed, those who drive a BMW and wear a Rolex are not happier than those who drive a Honda and wear a Timex. After reading these books, it occurred to me that there are actually two benefits of learning to live on much less than your paycheck. The first, of course, is that you can save more. But secondly, it also means that you ultimately need to save less. Someone who makes $50,000 but lives on just $40,000 can contribute $10,000 a year to her nest egg, and can retire when that nest egg is big enough to generate — along with Social Security and other benefits — $40,000 a year. However, someone who makes $50,000 but spends, say, $48,000 is contributing just $2,000 to a portfolio that must eventually help provide $48,000 a year in retirement. In other words, she's saving less yet needs to accumulate more. Thus, when it comes to retirement planning, adopting the lifestyle of the “millionaire next door” means you can save more toward a lower-priced goal. That's a formula that can help even non-millionaires achieve their retirement goals. Robert is a Certified Financial Planner, the author of The Motley Fool's Guide to Paying for School, and is the editor of the Motley Fool Rule Your Retirement newsletter service. There are 108 reader responses to "Nine Lessons in Wealth-Building from The Millionaire Next Door". Lesson #6 – Love the home you’re with. I think this is one of the most important lessons that nobody thinks about! If we live right next to someone that has a Mercedes and a large boat, after a little while, we’re going to want the same thing! But, if we live next to someone that is impressed with their new push-lawnmower, chances are that we’re not going to be inclined to make a crazy purchase on a big boat. Along the same lines, it you live in the country rather than the city, you won’t want those lavish things that the people in the city have. It’s just because you’re not seeing it as often, so you’re brain doesn’t trick you into thinking you need it. If you don’t want to get caught up with the purchases of the Joneses, make sure to distance yourself from them. I completely agree! If you are living close to the Jones’ and trying to be like them you are in a terrible position. If you work your finances in a better way you can build a wealthy retirement, whether through proper investing or MLM ideas. If you play your cards right when the time is right you can have those nicer things, but without the added stress of debt or long term financial commitments! Great article my friend! I agree with Derek that #6 is underestimated by many. I frequently counsel clients who plan to sell their homes in as little as 3 years–like when they finish graduate school. We live in an area where home prices are steady but the prospective buyers underestimate both the costs of buying and the costs of selling, not to mention the interest they’ve paid on their mortgages. I don’t think homeownership is, or should be, all about the money. But I get a little shiver down my spine when I talk to someone who thinks they can make a big profit after owning a short time. They’d probably do better investing the difference between their rent payment and mortgage and waiting to buy until they’re ready to land in one place for a while. Ahem, back on topic. This is a great book, and well-summarized here. The thing I struggle with is Lesson #5, specifically how to use that time wisely. Great review of the book and the lessons it outlines. And very timely, since I was planning on re-reading it. I have been saying for years just because someone owns an expensive car or house does not mean they are wealthy. It may mean they are in a lot of debt. My favorite quote from the book is “big hat, no cattle” which translated for non Texans means lots of crap, no networth. Essentially, to oversimplify the term, it means that if your parents keep giving you money, you will never learn to walk on your own two feet, and that parents tend to give more and more to the child who is not self-reliant and neglect the other children who are, which in turn makes the child being given the money/etc., ever more reliant on his parents and makes the other children ever better at fending for themselves. I have seen this in a few families and really believe it is true. It’s a good book! My favorite section was the one on money and kids and how not to raise kids who are permanently dependent. This is one of my fave books and a good reminder that those we see with flashy things and fancy cars might be rich but in fact many of them might be poor (i.e. in debt, overleveraged, underwater). I agree with this idea, but how does that apply to debt repayment? It seems to contradict Ramsey’s debt snowball method which is the dominant debt repayment plan on this and other sites. Do you pay yourself first, then deal with debts? That would change the order of baby steps– 1) save 10% for short-term savings/emergency fund, 2) save 10% in a retirement fund, then 3) start the debt snowball. There is an iPhone app for the debt snowball. I’ve used the snowball for both my house and business debt. 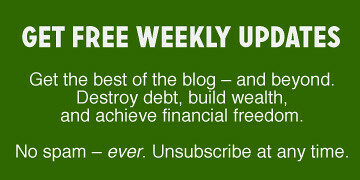 Both Dave Ramsey and John Cummita have excellent programs for debt reduction and wealth building. I followed Cummuta’s advice to the “T”. I can tell you that you will become wealthy following their programs. You just need to learn to say no to pretty much any purchases or fast food until you are completely out of debt. It is SO worth it though! The peace of mind that comes from being debt free and having money saved is priceless! My book keeper thought I was completely nuts when I applied the snowball to my business. She watched it work and then had to convince her husband that it worked. They are now completely debt free. The husband just lost his job of 30 years and they decided to go to Hawaii for 2 weeks because they could pay cash and not hurt their finances. It works if you stick to the plan! Good luck! You can do it! Denying or properly regulating the “economic outpatient care” as they call it is harder to accomplish in practice than when I read about it some years ago. Having one in college and one getting ready to go, I can certainly feel how hard it can be, especially if you as the parent have the means to over provide or the experience to see them heading for the edge of the dock. Best I can say is sometimes it’s better to let them risk falling in and getting wet, and being ready to offer a little help directing them to a ladder and maybe giving them a small towel for drying off, then constantly running interference trying to keep them from the risk of falling in or immediately pulling them out. Amazingly enough they don’t fall in all that often or fall off the same dock twice. Just curious, is the Millionaire Women Next Door by Thomas Stanley a recommended read by Mr. Brokamp? I looked up the Millionaire Next Door at the library and noticed there is a book dedicated to women millionaire’s. I’m not a big fan of the book as I found some great ideas but way too much time spent on buying cars and giving money to your children, neither of which apply to my situation (child free and driving a 12 year old Oldsmobile by choice). That, and the incredibly flawed “rule of thumb” formula. I read the book in my late 20s and as a accounting major I could not understand how any author would justify a 20 something having 3 times their current income in net worth when they graduate with student loan debt and have only worked a few years. That UAW/PAW thing is everywhere in the book and if it doesn’t apply to you it makes the book hard to take. This review didn’t mention, but as I pointed out in the last discussion on this, the formula really understates what you need to retire comfortably in your mid 60s too. So it’s bad for 20s and 30s and past 60s, really only applies to 40/50 year olds. That said, I’m glad this review tackled that point right away and said it doesn’t work for everyone! One criticsm I’ve seen laid on the book is that the authors have a Scrooge McDuck philosophy of hoarding money for the sake of having money. Like the grandmother who is told NOT to pay for a private school for her grandchild (the child lives in a bad school district) and she snaps back something like “what the hell else am I supposed to do with the money, burn it?” I think they go a little far in their frugality to the point of miser-dom sometimes. But it is good to see here in this review the *benefits* of frugality to this extent mentioned, happiness. All the self-denial should have some tangible benefit besides a big net worth. I would just think there is a large area between Scrooge McDuck and spendthrift, however that maximizes happiness. Like helping your granddaughter go to a good school instead of the crackhouse school. If someone were to ask me to point out one article and only one article from getrichslowly.org, reading which they could get the whole essence of the idea of getting rich slowly, I would be pointing them to this article. Good Job, Robert. Keep it up. After nearly two years of saving and paying down debt, I’ve just now realized “The Double-sided Benefits of Living Below Your Means”. If (well, when) I pay my car off, not only is that hundreds less out of my pocket in bills every month, but it means the balance on my emergency fund can be thousands lower since I don’t have to save ~6 months of car payments to cover a job loss. Where you live does matter a whole lot, but maybe not in the way that one commenter noted. I live in the country and not in the city, but have found it necessary to buy things that a typical city dweller may not have. For example, 8 years ago, I bought a plow truck to clear my driveway every snowstorm. A large expense at the time, but it saved me $80 (and probably much more now)every time it snowed AND allowed me to clear the drive the way I wanted it clear. We also made a decision 5 years ago to install a whole house generator that automatically kicks on when the power goes out. This happens quite frequently here in the northeast! Pwer went out last year while we were away and had it not been for the generator, I am sure we would have returned to burst water pipes throughout the house. Also, living in the country has forced us to buy cars more often just to commute to work, whereas as a city dweller (I used to be one once)I would just take the T and never had a car. And, yes I am exposed to the “luxuries” of life every day since I work in the city and am barraged with advertisements for all of it. I am not buying a Pandora necklace this year for Valentine’s day for my wife. But, she understands that! I just got around to reading this book last summer. Along with Your Money or Your Life, The Millionaire Next Door was the spring that catapulted me towards the goals I’m working on today. It’s easy to have misconceptions about those that own lots of flashy “stuff.” Sometimes the true measure of wealth is not how much you have, but by how little you need. I love this book. This book is what really got me determined to do something about my finances and a lot of the lessons learned in it whiz through my head constantly. Great review/summary. I didn’t know Dr. Stanley had a new book! This book also was the catalyst for my own financial journey. The simple truths and lessons of this book, presented and backed up with robust academic research made me decide to get my financial life under control, pay off debt and invest. It’s easy to have misconceptions about the wealth of those with lots of flashy “stuff.” Sometimes the true measure of wealth can be realized by understanding that it’s not how much you have, it’s how little you need! I just calculated the “rule of thumb” and it was spot-on with a difference of $1,099. What a nice article – and a timely one, for me. Maybe I’ll finally pick up that book. As Mr. Brokamp and others have mentioned, the rule of thumb for net worth doesn’t work for people who aren’t in their 40s or 50s. I’m 28 and am thisclose to being debt-free. When I did the math, I laughed out loud at the supposed net worth I should be rocking. Even if I hadn’t been paying off student loans, that just doesn’t seem possible. This is an excellent article. Every single thing in it that the millionaires say NOT to do, I’ve done. Especially the luxury home. I should never have bought it because it drained my finances for the 6 years I owned it. I live a completely different financial life today ~ I live in an older established neighborhood which I really like, I drive a 2002 car that still looks and runs great, I invest and save. I am much happier as a result. I’m actually going to be the odd one out here and say I really didn’t like the book. It may sound silly, but the identity politics of it really bothered me — I actually found myself feeling, “Oh, no, I’m not a straight white married tough-minded southern man … guess I’ll never be rich.” I just think some people who aren’t much like the people profiled in the book will just find it depressing. As a gay man myself who is in his 20’s I found it to be a good book. You just have to keep in mind who wrote it and who it is written for. I’m also a gay (non-Southern) man who read the book and I also thought it was good. Do people have such limited imaginations that they can’t adapt the principles in the book to their own circumstances???? I loved this book when I read it in my 20s. It had a huge influence on me and a slight influence on my husband, who is a bit spendy. (Drives a used BMW) It’s a bit depressing that we are missing the mark on the “rule of thumb.” According to my calculations, we should have $800K in net worth and we have about half of that at ages 40 and 41. I attribute this to our wages early in our careers being low. My husband has just in the past three years seen his income grow. Add to that our portfolios losing 40 percent of their values in 2008. They have recovered since, but still lost a lot of time for gains. Also, our modest house has held its value but not gone up. Overall, I am proud of where we are. We live beneath our means and still have a lot of fun. @Patti – that is what I dislike about the book. It takes a *very* flawed formula and makes people feel depressed because they don’t reach it. Why would the formula assume you’ve made the same money your whole life? It fails huge if you’ve had a big pay increase recently by assuming you’ve made that and saved 10% of it since birth. Ugh. FAIL. You’re having fun, saving, and living within your means. Who is this book to tell you you’re a failure at accumulating wealth or anything else? Ugh. I noticed there is another Stanley book titled Millionaire Mind, is it worth a read? I have enjoyed the book, and find it tough to argue with these points. All reflect wisdom that has clearly worked with a sample of people. #1 above is really a good one to examine further. Yes, income does not equal wealth. It’s what you do with your income that can be most impactful for the most of us. Having said that, income itself IS an important driver in achieving wealth. You need to make money in order to save it. If two people have comparable expenses, but one has a higher income, who will be more likely to accumulate wealth? The key there is keeping expenses stable while avoiding increasing them as income grows. @18–Thanks for the catch! I’ve made the edit. The MND is a must read for anyone who is searching for financial independence. Yes, you will have to make some sacrifices like luxurious European vacations. Is it worth the sacrifice? You’ll have to answer that question. Wonderful summary of books I haven’t yet read, I’m checking them out of the library ASAP for details. Thanks! ps- @ #32 Kristen– I’ll heed your advice and start with the Millionaire Next Door. Thanks. #24 — Thank you for saying exactly what I felt when I read this. Excluded. So since I’m a single, urban woman who doesn’t own a home, I have no hope of being rich? Ugh. I guess I should move to the middle of nowhere, find some 60 year old man to marry and quit my high-paying job to stay at home and be frugal. I am not faulting the book, it is an amazing read. But I would have liked more if it also stressed about “educated” life choices – You don’t have to be frugal in every aspect of your life, have control of your money, save on things that are not important to you, spend on things that makes you happy, know the meaning of sacrifice and if you choices makes you content with life, with little less money in the bank, so be it. I read this book two years ago and I loved it. Like many of you, I was a bit frustrated by the net worth formula. Clearly this formula is for people who are more established and have been earning more than a year or two. I’m 26 now, have been in the same job for 3 and a half years. This formula tells me I should have about 88% of my total post college earnings in my net worth. Two years ago, I think net worth the formula gave me was more than my entire lifetime earnings to that point. That said, does anyone know of any similar formulas for twenty somethings? For me, as a general rule, so long as my net worth goes up, I’m happy. Right now, I feel if I get my savings rate close to the to the 15-20% recommended by the book then I’m doing pretty good and that for me this is a better indicator of my accumulation of wealth than if I am close to that formula. Great article and two good reasons to live below your means, yet the most satisfying ability attending a surplus of any resource is the ability to give it where needed. Jesus said, “it is more blessed to give than to receive”. Trying it proves it true. I’ve read this book and while it is really a great eye opener to the power of budgeting and saving and it can be a source of ideas for budgeting, I think many people who read it take the wrong message away due to the hidden bad assumption in the title: Having a million dollar net worth DOES NOT make you *rich* by modern American standards. “Millionaire” was used as a synonym for “rich” in the 60s and 70s because that was an INCREDIBLE amount of money at the time. But, to be honest, it just isn’t anymore. I’m sure many people read this book (and the book kind of enhances this feeling due to the language used, etc) and think, “Wow, there are all of these “rich” people who got that way just because they saved their asses off” but, truth is, those people are not who we envy or would like to live like when we think of the idea of being “rich”. The fact is, to be able to live a lifestyle where you are not scraping and saving all the time, you really do have to have a huge income AND have the ability to budget that income (you can go broke with any income as the book states but it wrongly implies you can be “rich” with a modest income). And to be honest, I think this is what most Americans actually want. The people who are in this book are upper middle class people who live like lower middle class people with austere lifestyles and as a result get some added security later in life. If that is what you are shooting for, great. But I actually don’t think it is what most people are aspiring to financially. Rampant consumerism is horrible in our society but I think the lifestyle espoused in this book is too much the OTHER way. So, taken as a source book of budgeting and as an inspiration to stop hyperconsumerism it is awesome. But as a way to “get rich”? This is only part of the story and you need to balance it with some quality of life while you’re still young. IMHO. @ #24 I’m single, child-free and I rent and you also echoed my sentiments after reading this book. The profiles of what the millionaires in this country look like are interesting, but not practically useful. I couldn’t really apply anything from this book into my own life. I almost stopped reading after finding out I was a UAW. I think I stopped reading after the chapter about “economic outpatient care” or something like that. TMND is not a how-to book–a point that gets ignored amidst all the glowing reviews it receives. @29: I took issue with your comment about having to sacrifice “luxurious vacations” for “financial independence”. In my mind – I want the independence in order to TAKE the vacations. I can see your comment being a little more balanced by adding “worth the sacrifice early in life” but really what’s the point of sitting on a ton of money? Use the money to have good experiences that you enjoy within reason (ie, no debt). “Retirement” can come at any age – that is, when you no longer need a job to sustain you. But this does not mean giving up things you enjoy, it just means you have to balance those things or make enough money to do them all. No debt is the key thing to keep in mind, not no fun. Stop Acting Rich got too much into what kinds of wines and liquor the rich own; that got old and annoying quickly. Other than that, it was just okay. I guess it did save me time from asking every millionaire how they achieved their wealth. Time is money, ya know? Ok I have to comment on something. It kind of makes me laugh a little when people say — “this rule of thumb is bogus because my numbers don’t match it”… LOL… Guys, not to be rude but that means you might NOT BE A PAW (possibly — you can always catch up my increasing income and investing while decreasing expense). I also hear people say things like, “my numbers don’t match the rule of thumb because we made less money when we were younger”… Nooooooooo — you just weren’t living below you means (however meager) and saving/investing 20-30% of your income. You might also mention that you have a lot of student loans — so that’s why your numbers don’t match… Noooooo — what this means is that you didn’t get any scholarships or save the money out of your income (in high school etc.) to go to college without student loans like a PAW would most likely do. People think the ratio doesn’t make sense because everybody is underwater on their homes — but many PAWS take out tiny mortgages or pay for their house with cash. Think about this — how long have you been living within your means, investing and otherwise doing financially responsible things? If some of you were honest you would admit that it has only been for a couple years. You may think the ratio is off base because you are doing all the right things but don’t fit in the guidelines. However a PAW of your same age and income may have significantly more assets than you because they have been practicing this wealth accumulating behavior consistently FOR YEARS AND YEARS AND DECADES. I grew up very poor but I am firmly in the PAW group at age 25 because of my behavior (seriously living below my means and investing the difference) when I was making $5,000 a year and when I am now making $110,000 a year. Also I disagree with those that say the book is not a how-to book. The book profiles REAL MILLIONARES — if you want to be one then just emulate the behaviors that are outlined in the book. Our friend over at freemoneyfinance.com read this book years ago and is a millionaire that lives a very comfortable lifestyle because he followed the principles in this book. #24 hit the nail on the head! Missed that post earlier. A ton of the profiled in the anecdotes of TMND were older white males who didn’t have a college education, owned their own businesses, and had a stay at home wife for their now adult kids. Sort of exclusionary for a reader like me single in my 20s to associate with but I took that with a grain of salt since those people were a “typical millionaire” in the mid 90s. Those people are so removed from my life that it’s hard to listen to the “tips” given by the book and associate with them : “buy cars by the pound”, “don’t give money to your kids”, how is that helpful to me? But the general message of not assuming the BMW drivers are all millionaires is a good point and the book makes that loud and clear. Social commentary with a lesson? Yes. Self help personal finance book for the masses? No. Also liked #35 – very good points! I was incredibly inspired when I first read this book – the idea that millionaires were actually “normal” people really took hold in me, that I, too, could be a millionaire one day. What I did find, what that the book was very heavy on statistics, and there was less interpretation than implication – which I think is what the commenters about are saying about not being a married white male with a SAHM being frugal. If anyone has read all of the books, I’d be interested in knowing if the others are worth reading, or just rehashes like some other PF authors’ books. We went through this last time. The formula is flawed and makes no sense for people in their 20s nor for people in their mid 60s about to retire. I believe the authors of the book even came out and said so when pressed. Why would you defend something the creators of the formula have even said is a flaw in it? Go back to that thread and look at the comments. 65 year, retiring, made $75,000 a year before he retired. To be a PAW he would only need a net worth higher than $478,500. If he withdrew 4% of that a year (general guidance), he would have an income of $19,500, a decrease of ~75% in income compared to pre-retirement. That is not near enough, but the formula you say works for all says he’s a PAW! So it must be true even if he eats cat food!! 25 Year Old. Has worked for 3 years, and because he was diligent, he paid for his education himself and graduated with no debt! What a PAW he is. And now he just got a raise and earns $50,000 (previously he made $40,000). He should have a net worth of $125,000, though he has only earned $130,000 in his lifetime. So he should have saved 96% of his gross income? Wow! Too bad Uncle Same took about 33% of that gross income leaving him with only 64%, before he had to take care of pesky things like shelter, food, and clothing. I agree with Adam (#12). I think too often people forget that money is a mean to an end, not the end itself. Furthermore, no one is guaranteed tomorrow – I can’t think of anything I’d regret more than dying with a bank account filled with millions and unfulfilled dreams. So if you can chase the things you want to do in a financially responsible manner – whether it’s travel, entrepreneurship, or something else – do it! What else are you going to spend the money on? I get what you’re saying but I don’t believe that everyone that drives a BMW is poor or in debt, some people are rich and live rich and they’re happy. What’s wrong with that? The rich help keep the economy going. What’s wrong with that? Absolutely nothing. No I’m not rich. I don’t believe in sacrifice. I believe in spending consciously and not living like a miser. I don’t have debt, my credit scores are in the 700s. I don’t think there’s anything wrong with going on a nice vacation if you can afford to. If you read history, humans never tend to do well with self-denial for long periods of time. I believe in spending consciously and not in sacrificing my quality of life. You know my parents are retired, they travel, they have two nice homes paid off, they eat out, etc. They never had debt, always saved for what they wanted their entire lives, they’re middle class but they’re able to live nicely. They’re the type of people that shop around before they buy and it seems that people say you have to be a miser to become well-off in old age and that’s not true. I think what helps them is they don’t overspend, and they don’t have money pit hobbies. IMO you can have what you need and want if you stay out of debt, educate yourself financially, save and invest and don’t overspend. Its possible to retire and live nicely without having to be a miser throughout your 20s,30s, and 40s. This books seems to say that you need to be a miser if you want to be well off in retirement and old age and that’s just not true. I have to totally agree with Nate (#40). I don’t think the formula is as flawed as so many people WANT it to be. When I graduated school at 22 and got my first “real” job that paid $48k/a, I was a PAW because I had these funny things called part-time and co-op jobs since I was 13 and started saving even then. Wow Ann. Great you had part time jobs that let you save over $200,000 at 22. You know a PAW is someone who has twice what an AAW does ($48k x 22 / 10 x 2 = $211,200 net worth). Were those co-op jobs as a drug dealer or high priced call girl? And forgive me if I don’t believe you that you had $200k in the bank of your own money that you made working at McDonald’s when you were 22. Do you guys even know what you’re saying is ridiculous? Wow! What is with all the hostility toward this post? The Millionaire Next Door is not meant to be a blueprint of steps to follow in your life. It is a snapshot of people that have achieved Millionaire status and some of the decisions that they made to get there. That does not mean that you need to do every one of their steps or any of them for that matter. It simply points out a few statistical facts…do with them what you will. Is the formula flawed? Absolutely! But all formulas that attempt to give simple answers to what are very complicated questions with multiple variables are flawed simply because the variables are too great.That doesn’t mean that they are a bad place to start. There is a lot of wisdom and information to be taken from this book (and this post). Instead of dismissing everything because you don’t like one little piece of it try looking at the bigger picture. The formula needs only two simple tweaks to be solid and useful. First, the formula should probably ignore the early years before an individual is capable of earning full-time income. So a starting age of, say, 20 is more appropriate than starting at birth. Second, since the basic cost of living is greater than zero, the formula should probably establish a floor below income is not counted. A minimum wage income is insufficient to build wealth commensurate with a PAW unless you are exempt from the cost of living – say, by living with parents for free. Hey Suba– don’t knock Penny’s! Their white goods (especially the towels) are really nice! And we’re very picky about towels. There is also some minimization of barriers to wealth that are beyond an individual’s control. I can’t quite be bothered to find exact statistics, but I’m pretty sure that there isn’t a lot of social mobility in the U.S. To a great degree, our incomes are determined by our parents, ethnicity, gender, ability status, etc. Which is not to say that frugality and salary negotiation are futile, but there’s a great deal of victim-blaming of the poor, and privileged persons tend to chalk extremely good luck up to personal effort. In a roundabout way, what I meant to say there is that TMND sounds more like a profile of the privileged than a how-to guide. This is awesome!! I’m in my twenties with a negative net worth (student loans), BUT I’m on track to paying them off at a faster rate (6 years vs. 13 years, and paying $10K less in interest), I have a budget, I track ALL my reciepts and know exactly where every buck goes, I have a goal of reaching $2million for retirement, I have a strict bi-weekly sit-down-and-plan-the-finances session, I love where I live (although I live in SoCal which is very expensive), I love my fiance who is just as good with money as I am, I own a Toyota, and I’m happy. Sounds like I’m 100% on the right track to reaching my $2million goal! I’m 32, and I prioritize what I want in life. Financial Freedom. I net about 39K a year ($3,250 a month). The biggest key to my success in saving is keeping big expenses to a minimum. I am happy where I live. My rental is 1650sq ft with an attached 1-car garage. I pay $650 a month to live there plus approximately $100 in utilities. I also own my cheap used car outright. I was 30K in debt when I graudated 7 years ago. Now I have 80K between cash and my retirement. This is 110K swing in 7 years. I still get to enjoy the things I want to do which is travel,fine dining, and attending sporting events. I can tell you were offended by my comments — I apologize if you took it personally (it appears you did). Your examples are slightly flawed. Let me address your example of the 25 year old since that is my age and I understand what a PAW in this age group looks like. Here is the first problem in your example. You say this guy has worked for 3 years and has only made $130,000 in his lifetime. You need to know that most PAWS have worked for MUCH MORE than 3 years by the age of 25. I started working when I was 13 years old. I have the cash to purchase a house outright today if I wanted to — I’m not bragging here — just pointing a slight flaw in your example. You can be mad at me all you want but I am just making the point that the formula is more accurate than most people give it credit. But hey — I enjoyed reading your response and I agree that the formula is NOT perfect — but in my opinion it is more accurate than most people give it credit. Also I just saw your response to Ann — that is so rude dude. Seriously. Like I said above — the wealth that a PAW puts together does seem weird and it would be totally hard for you to comprehend a 22/23 year old with close to 200K… I am not even going to tell you my net worth because I think it’s pointless to do so. But I will tell you that although I started out making $3 an hour working at 13 years old —I quickly started my own lawn care business where I made more than the national yearly average family income before I was 18. I respect your opinion Adam — fun to discuss! Have a good night! I get so frustrated in dealing with people who think I must be stupid…because I “look” poor to them, therefore, I must be stupid. I just have no time for these individuals. Little do they know, by 25, my numbers met the math at the beginning of this post. Na na na boo boo to them. @ Nate – I’m more concerned with the fact that the so-called “benchmark” DRASTICALLY underestimates a retiree’s needs than the fact that it fails to reflect the realities of 90% of 20-somethings. Adam’s example of the 25-year-old feeling bad (unnecessarily) for not accumulating a NW of $130K pales in comparison to how bad his example 65-year-old will feel finding out that the book told him he was doing awesome, except he now has to figure out how to live on less than $20K a year. You didn’t address this at all, and in my opinion, a benchmark that fails 2/3 of the group using it can hardly be called a benchmark. Personally, in order for us (myself and hubs) to meet this book’s benchmark for an “average” accumulator of wealth at age 30, we would have had to live on $1500 per month for the last 8 years. Sure it’s doable if you had no choice, but why would you want to? Just to meet some arbitrary benchmark of “average”? I highly recommend listening to this book on tape — it is a great conversation starter if you have your kids in the back seat as well. My husband and I listened to it while on a road trip, and would often stop the tape and discuss whether or not we agreed at different points. Is it a perfect book? No, nothing is perfect. But we did find it encouraging and a good jumping point for some good financial discussions. @ Adam, while the basis of your argument may have some validity, your sarcastic and belligerent tone dilutes what you’re trying to convey. Why do you feel the need to attack others in a vicious manner (e.g. drug dealer, call girl) in order to make your point? I agree with Nate (#40) and Ann (#46) that the rule of thumb is not as nearly as flawed as we like to believe. When I was in my 20s, I was a UAW, and yes, I was disappointed but I knew why deep down inside. I was living beyond my means and from paycheck to paycheck, despite making a decent income for my age then. I’ve changed the ways I approach spending and manage finances in the past 8 years. I’m in my early 30s now, and the rule of thumb tells me that I’m an AAW. I’m still disappointed but I know why. My husband and I do save and invest, but we also enjoy life by living it up a little (e.g. travel, splurge on little luxuries here and there). Just because the rule of thumb did not work for the majority of people does not make it an unworthy benchmark to measure one against, and just because you don’t agree with it doesn’t render the lessons of the MND book useless and certainly doesn’t justify your behavior. And, yes, I did have that much. The stock market did a funny thing back in those days: they went up. And you do realize good co-op jobs paid students, on average, $3k/month, right? Mickey D’s? Hah! Try HP and Microsoft. Adam was right. I was not a PAW at 22 as I forgot PAW means having double the formula (I think; can’t verify now). But I’m definitely a PAW at 31. The problem with the “formula” is that it is very sensitive, in the early years, at least, to the strategy one used to start accumulating wealth. On the one hand, you have the 13 year old who starts his own business and is able to meet the PAW specification by the time he is 25 – but may possibly not have had the time to devote to an education. On the other hand, you have others whose strategy was to focus on education, perhaps going into significant debt, in order to secure the good salaries that guarantee they won’t fit the PAW formula at 25. However, by their 40’s or 50’s, both individuals could very well fit the formula to a T.
Even though I use the teen business owner as an example, I know little of his actual circumstance, so it is just a generality. For all I know, he may have also gotten 4.0s and a Harvard education in that time. While not a perfect rule of thumb, I do agree with those who say that many arguing against it are not really considering that a PAW doesn’t start their financial life at 22 or 23. For example, I have 3 children. They each get the same amount of money for allowance (based on age). In order to support the children saving money, we match any money they chose to save dollar for dollar. Our oldest saves the least, but still saves at least 20% of allowances. But even our least saving child has already saved enough to start an investing account at Vanguard ($1000 minimum buy in for the STAR fund, $3000 buy for most others). That’s because they also do save the money they receive for birthdays, and other special occasions. That money really does add up quickly. Once they start earning money with jobs, I am sure their savings will grow even faster. If my children continue to save as they have been, and fully fund their Roth’s while in highschool and college, without assuming any real gains they will graduate at 22 with $35K in retirement, $15K in investments and approximately $10K in savings. That is 60K before even starting their first “real job”. This isn’t impossible – my college boyfriend started his doctoral studies in that position. And was paid while getting his PhD from 22-27. At 27, nevering having made more than 14K a year – he had almost 100K in savings, investments and retirement. When he got his first real job our of school – it was easy for him to continue to save even more money. 26 years old x 14K income/10 x2 = $72,800. It can be done. It just isn’t all that common an occurrence. Being a PAW isn’t something that happens overnight. It is the result of saving a lot (at least 15-20%, more often more than 30%) of your income over many years. Something to keep in mind… As long as you make no income, you meet the definition of a PAW – even if you have NO savings. Unless you are under six years of age, the first year you make any amount of money, it is impossible to be a PAW – even if you save 100% of your earnings! Without this change, you have people who switch between PAW/non-PAW in a single year because they had a big salary increase/decrease with no change in habits, people who save 50% of their earnings every year but fail the formula because they started late (due to school or a change of habit). my guess is that people who have attained much of what the book outlines feel good about the book…and the rest are looking for more excuses for why they aren’t where they feel they should be financially…I agree with 48…it’s just statistics…do what you want with it. I for one drive a 10 year old suburban and don’t care what people think about my status because I know I could write a check for these overpriced status cars they all think they need so they can show off…it’s bad because now kids are talking about who is “rich” or “poor” based on the cars they drive or the houses they live in…i just tell them that just means they blew all their money on a depreciating asset (car) whereas I prefer to keep that money in the bank making more money for me. 1. I read (in the book “Predictably Irrational” I believe) that comparisons – comparing ourselves to others – has a huge influence on us, even when we are aware of that fact. It is also what advertising tries to get us to do. Consider this in light of the once popular notion that to “get ahead” first dress and act like you are already ahead (including the car, the house, memberships, etc.). We are given signals every day (bombarded one could say) that are contrary to good financial sense. Remember the government telling us to “spend, spend, spend” to help get the country going? How good of advice is that for the individual? 2. I’ve used Quicken to track my spending for about 20 years now. I know, for example, how much we spent on gas last month and last year for the same month. Knowing how much “life costs” makes financial planning almost easy. 3. For those folks concerned about balancing savings with spending, Dr Korlikoff’s “consumption smoothing” is something I use to answer the question “what can I do with what I already have through the rest of my life?” Both his ESPlanner tool and Quicken planner (and I am sure other tools) are good at answering such questions including: What happens if I do buy that BMW? What is the impact if we go to Disney World? What happens if I lose my job? How much do I need to make from a new job? This works especially well when #2 (“life costs”) are well known. 4. When I graduated from college and joined the Air Force, I first rented a studio apartment and had a ten year old car I had purchased from a roommate. Most of my peers (young officers) had nice apartments, bought nice condos, nice cars, lots of nice stuff (stereos, TVs, microwaves, skis, golf clubs, clothes, etc.). What we do early in life makes a *huge* difference later in life (I also didn’t start a family until my late 30s). 5. Dr Stanley gives us great hints on what we can do to accumulate needed wealth, instead of squandering it, by showing us what “rich” people typically did. I had often wondered, for example, if I should have bought a bigger house in a more upscale neighborhood (nope, made a good choice). I’ve also wondered, being a bit geeky, if I should focus more on “dressing for success?” Again, clearly no – not necessary and doesn’t help. I love his data & economics driven analysis even if many of his examples are about people who are not like me. Of course, I don’t believe this, as you can tell from my previous post. It sounds like your children have developed some good habits that will likely lead them to a healthy financial life. Well, we’re AAW’s but we’re only a year or so away from being MND’s. The formula is probably fine for folks not in their 20’s. We had a lot of student loan to pay back, and some credit card debt. We’ve come a long way. Given the huge hole we had to dig out from, I’m not sure we could ever become PAW’s unless our income takes a nose dive. ;) But that’s ok, we live well enough – two newer, nicer fully paid for vehicles, vacations most years, and private schools – but we also live well within our means and have saved about 20% each year for the last 5 years or so. We don’t want to save money just for the sake of saving money. We save money for both the sake of security and for living well. I assumed the 25 year old in my example was working at 13 and through highschool then used that money to pay for his university education and room and board while at school. If they didn’t then they took out loans and would have negative net worth against the savings from their 13 year old jobs. That said, that $125,000 I stated was wrong,that would be a AAW. To be a PAW, they’d need to have $250,000, or twice what they have made GROSS since starting work a real job after school. And what about taxes? Just face facts, the formula is not right for 20 somethings. Not really even right for 30 somethings. It works for 40 somethign and 50 somethings but NOT for retirement since you will be seriously low on net worth when you retire if you are just an AAW or even closer to a PAW. I’ve shown the numbers, and since I’ve never met anyone “next door” or otherwise who finished university with hundreds of thousands saved up that they made themselves (inheritance and gifts from family are not included in the formula). What others have said, the formula is a benchmark for a subset of people of a certain age that fails outside of that range. I just wish the authors had said so when they first introduced the formula in the book. @Sashi, as soon as your son starts working a real job and makes more than $14,000 a year he is not a PAW anymore, as #62 says at 60k income they would need $270k in net worth. Your example proves my point very well. The formula is flawed for 20somethings. I am not really questioning the validity of the rule of thumb. It is just a formula. I am just a bit sad that, having read the book many years ago, applied the principles to my life and saved at least 20 percent of my income … we aren’t even in the ballpark. Even if we saved more and worked harder, I don’t see us having $800K + given the market losses and housing market. We just didn’t earn enough in the early years of our career. Now that we are earning and saving more, I still don’t see PAW status in our horizon. Right now, I count our child’s college fund as net worth, but 15 – 20 years from now, it will probably be spent … on her education. Salting away a lot of dough just isn’t our goal. We just want to live a fulfilling life, have a lot of laughs and not outlive our money. A lot of bickering in the comments. The key is balance and planning. Know what you need at retirement and what you want at retirement. Focus, save, and implement your strategy. Simple as that. I look at my finances like a business. If I am not hitting targets, I cut expenses and rebalance. This bickering is counter productive. I’m 70 now so the book wasn’t around when I started working at 14 for 45 cents a hour. Most of the book applies to me – and my wife of 49 years. I was a high school drop-out at 16. Served an apprenticeship and was a machinist at Ford Motor Co. I purchased a new house when I was married in 1962 for $10,840. A non-work related injury ended my job and left me disabled at 28 with two young children, a useless journeyman’s card and no money. I sold my house myself for $22,000 in 1969 and moved to Arizona for my health. Got my GED. Used the house profit and my wife’s earnings at Taco Bell to put me through college. Nothing I learned in College was as useful as thinks I learned myself. First – If you can borrow money to buy an asset that produces an cash flow sufficient to service the debt – the asset is free. Second – Popcorn and Koolaid can be a fun luxury if you perceive as such. Third – never borrow money to buy a depreciating asset. Fourth – never throw away anything that can be reconditioned for half the price of a replacement. Fifth – live below your means. Sixth – study the Federal tax code and utilize every technique to keep the money you earn. Seventh – try and do something constructive with your time (a finger in the eye of “reality TV”) And lastly – marry (and respect) someone who shares your values AND your sense of humor. In 1972 I bought my first Arizona house to live in. I bought my first rental in 1973. My second rental in 1974. Two in 1975, by 1985 I owned 18 single family rentals with no negative cash flow. When we needed money I borrowed against the rental houses. No tax on borrowed money. I didn’t pay any taxes for 15 years since the Tax Code say’s you can write off the house purchase against the income. Got a little crazy in the 80’s. A 500SEL for me and a 380SL for my wife. A 5br 4ba in a gated community and no debt but a mortgage. That ended in 1987. Today I live in the nicest of my rental homes which is free and clear. I have three cars – the newest is a 1989 Nissan Maxima. The other two are classic cars – a 52 MG-TD and an 82 Malibu. I cashed out of some of my rentals during the crazy housing bubble and manage the money in a fixed income portfolio. I spend two hours a day buying, selling and hedging. I put my Daughter through medical school and she is a debt free Doctor with no student loans. My net worth varies from day to day but it is higher every year. My wife and I have changed habits and don’t cut coupons or vacation in a camper anymore. We’ve been to 40 states and most of the islands in the comfort of 4 & 5 star hotels. We have agreed to try to avoid dying with money. A Downriver Detroit boy who got out. Sir, you have an inspiring story. I was 12-14 when I wanted to start my own business but dont have enough money. My mother won’t lend me USD $ 150.00 to be a furniture sub-contractor. Started a lot of small businesses at that time, but it was not enough to change things. At the age of 17 got my break when I started my construction company and made USD 5,000 a week (this money was huge back home). Few years past, I need to sell all my equipment since my mother was unemployed and my younger brother needs money to finish his college in the US. I have another run at age 21. I land a huge multi-year contract (forever) worth $10M (nets USD $40K/month). At that time, all I can say is I can retire and have some fun with my life. I have work days and night, sometimes 5 days straight with no sleep and death threats. While I could choose back then to be a normal child, go to movies, date with girls or eat at restaurants. Then here comes the sad part……My mother, brother (the brother that I put in college school in US) and sister now wants to get all the profits from the operation. They just look for ways to kick me out. After a year of no communication, I decided to call it quits. It was not worth it to sue my family in court and also to preserve the unity. So I decided to come to US to start all over again and move on. (July 2006 Age 26) After a month, I have found a job. My first job was in 5 star hotel housekeeping paying me USD $ 7.50 an hour. After two months I found an engineering job $22-25/hr. A year into the job, I manage to save around USD $ 10,000. I quit my job and started my own business as a federal government contractor. In my first year I netted USD $150,000 operating in a room that I rented from my friends apartment using only a laptop computer and vonage. Now Im 30 years old. Just started learning the 401k, 403B, 457. In the formula, how are pensions treated? If you think this only applies to MWM- look around a bit for a mentor. First- MOST millionaires I know own their own companies or have two people who work for government agencies. My sister is in this group- big time- and shares the ownership of THEIR company. My good friend and her partner are PAWs and they both worked for the state prison systems! They have been together for about 25 years- bought a house together, drive used cars and still have several mil in the bank. They always lived on one salary and are excellent investors. For those who think millionaires take NO vacations or have fun while accumulating- that is not so. They simply do it within their means. That means that they look for vacations that incorporate their businesses (the prison guards who went to Italy for a convention on Italian prisons). Sis drives a semi new car- it has their company logo on the side and it is owned by the company. Multi millionaire next door is more common than you might think. Apply the “save half” and live like the rest of the real middle class. Your children will be happier (going to neighborhood schools and enjoying sports during the regular seasons), you dog will have scruffy hair (like it is supposed to have), and you might even find yourself happy at 65 instead of looking for love ( sorry Heff). And the formula—has worked for me since we were in our 30’s. Agree w #24 and #34. I downloaded a sample on my Kindle and was put off by the stuff in the beginning where they list things about “our wives”. Okay…so the spouse isn’t a millionaire? It was just written from such an exclusively male perspective that it kind of threw me off. Only two weeks ago, I purchased a ten-year-old Toyota – with cash – before reading this post. While I read “Millionaire Next Door” many years ago, it was nice to pick up some reminders of why I read the book in the first place. Nice to know I’m adopting the habits without even realizing it. It’s funny how, whenver this TMND gets discussed on this forum, people always seem to get hung-up over the formula. The only “flaw” to the formula is that there is no lower limit to the age for which the formula should be applied. That said, it’s still not implausible for someone in their early 20s to be in the PAW category. Many assume just because they went to college and took out loans that that is the only way to do things. Some people started businesses or entered the workforce directly in their late teens and did not go to college, so they never incurred the large debt load that many of us have. For them, the formula works. Also, the formula is not a gauge of whether you will be comfortable in retirement or not. It’s not a retirement formula. It’s a statistical comparison to others in your age and income cohort. TMND is not a guidebook to riches per se, but that in no way disqualifies its significant findings on what real millionaires did to become real millionaires. The ethnic or geographical makeup of the millionaires portrayed in the book should not discourage the reader from continuing to read the book or emulating the methods that those millionaires used, because the method is universally applicable to accumulating wealth regardless of ethnicity or geography. In my opinion, people are nitpicking and trying to justify why they don’t agree with the book when, in fact, they either haven’t completely read the book or are so self-centered that they dismiss anything that doesn’t apply to them as wrong or useless. Adam’s post (#49) is totally inappropriate. Calling another poster a prostitute or drug dealer is not warranted. #41-I am reading Stop Acting Rich right now. Not only does he spend a lot of time on spirits. The watches and suit thing is sort of annoying too. I haven’t wore a watch since I got a cell phone ten years ago. DH and I have bought three suits between the two of us in the last 15 years. Anyway using these as markers seem pretty dated. Maybe amount spent of fancy cell phones and purses would be more relevant to 2011. I think part of the reason that MND techniquest makes people happier (whether or not you meet his “benchmarks”) are that you have better flexibility, choices and autonomy. I want to retire as soon as possible. Unfortunately, I started a bit late with the frugality/investing thing, and have to put away around 25% in order to maintain my income in retirement. So I have to sacrifice some. Hopefully, it will be worth it once I get there. Man – I am now just starting to absorb the “Millionaire Mindset”. It’s taken me years to realize that I’ve known several millionaires of the unassuming type! I agree with Leslie above and that’s where I used to go wrong – it’s never about the specific steps, it’s about the overall mindset and making and making YOUR OWN STEPS, finding your own way. You will never replicate what someone else does the way they do, and vice versa. Harboring resentment is the wrong focus and you’ll only be thinking about the wrong things. Yeah if someone else has become a millionare so can you. But you have to do it your way, don’t be someone else. Nice article, but I cannot recommend this book. I read it a while back and gave up about 80% through. The author is obsessed with giving percentages and presenting them in a way that benefit his point of view. It was annoying to say the least. … and I now drive a BMW (used), bought it with cash. I made it a goal, I saved up for years, I searched for the deal and I haggled with stony patience. I had been driving cheap practical cars my whole life, and I wanted a sweet smooth comfortable machine for myself. No debt, no guilt! I am not a millionaire yet, but I’m getting closer every year! The emergency fund is growing and we take the time to have a family hobby too. It’s a life balance, frugal doesn’t have to mean depriving yourself of pleasure. Saving doesn’t have to mean boring either. I will be the MND by the time I am ready to retire, in my modest suburban home driving my used BMW, I’m sure of that! Bravo! I love the books by Stanley/Danko. In fact, I’m quite surprised that most of the financial bloggers out there do not “quote” from them nearly as much as they probably could. Maybe they haven’t “really” read them .. and that’s too bad. I read the MNDoor and The MMind at least once a year .. via Audio book. It reinforces many many things that I/we incorporate into our lifestyle. I’ll even go as far as saying that our financial life turned around after I read thee books, and then got my wife to read them. We talked about the concepts and made a plan. We’ve been debt free for quite some time now … altho’ we do not own a home, we put away almost a ton of money, and use it to make more (via futures/stocks, and for the last few years in commodities coming out of the ground). The ideas you outlined (quoted from the book) are spot-on. Alot of people fool themselves about the truths behind being a PAW, versus a UAW. or even the average acc. of wealth (AAW). More people should read, and reread those books. there’s “other” writers and guru’s out there but Stanley is just reporting the facts. Listen and learn. Thanks for talking about The Millionaire Next Door. Definitely in MY top-5 best non-fiction books. I read this book some 15 years ago. It inspired my wife and I to continue what we had been doing already for some time in regards to becoming financially independent. Of the nine lessons listed in the original blog posting we are nine for nine. Becoming wealthy is not easy. Like several bloggers I started work at a very young age. My wife started at a very young age. We both have lived below our means. However at age 49 we now live like no one else because we both sacrificed at early ages. For those of you hung up on the ratios at a young age get over it. Follow the lessons listed and you will do fine over a period of time. Very late comment, but most of the millionaires next door are high income individuals (i.e. more than 100 000$ annual income) if they save 20-30% of that they can still live nicely including vacations and good cars but maybe not the most luxurious ones…I also think that many of these peoople in reality drive very nice cars but only because it is a personal interest not to impress the neibours or co-workers. To me this is not miserly it is good financial sence. 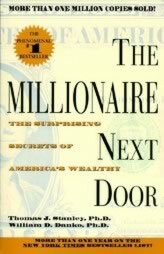 The Millionaire Next Door is the third most fascinating financial textbook that I have read todate. To my fellow readers I would like to recommend Rich Dad Poor Dad and The Richest Man in Babylon. The Richest Man in Babylon is difficult to read especially if English is one’s second language,however, the lesson it contains is marvelous. I wish the governments could prescribe the Millionaire Next Door and the The Richest Man in Babylon as one of the literatures read at school or colleges. I thank this collection of books for changing my perception regarding lending money. Dave Rasmey will get you on that track. My wife and I live this way. Debt free (except our average home), saving, living below our means and can get by on one income. We are not chasing material status symbols. We both drive paid off cars. My SUV is 10 yrs old. The average family income here is $50k. Ours is almost double and we can get by on one. By retirement, we too are planning to be millonaires. A good marriage is the key too. The great thing about finding a property bargain is the instant equity that you achieve. This equity won’t make you instantly rich. But it does set you up for purchasing more property. And by holding onto well-positioned properties, you can become rich by enjoying the capital growth over the years to come. Wow, so many people are angry about this book. I recently became a financial counselor and I hear a lot of the same complaints. No one is telling you not to enjoy life. I tell my clients to create an emergency fund, invest in a 401K and IRA and also have a “Go Getter Fund”. The Go Getter Fund lets them EARN the finer things they have determined that they NEED to enjoy life. If they want to take a $20K vacation fine, but save for it first then take the vacation. If they take that vacation on credit, they will be paying for it the rest of their lives. Forget about the actual dollar amount of 1 Million. The book is trying to get you to focus on being independently wealthy. To me that means not having to work for your money, but having your money work for you. My parents are in their 60s and still working because they never focused on retirement planning – I guess that doesn’t matter now since they can’t afford to retire. My “job” is a US Marine. I have been working for Uncle Sam for almost 18 years. In 1995 I made less than 12K a year, but I was living just fine. I was given food, shelter and even clothing. College tuition is 100% paid for and I get to travel a lot. Most people think the military does not pay you very much, but I am a PAW and I have done it on the military pay. I take advantage of the Thrift Savings Plan (TSP) and have an IRA. I also have a rental property, MMAs and CDs. I will retire a millionaire in then next few years at age 38. I may get another job, but I know that I will not HAVE to work again because the interest earned on my investments will earn income for me. The military lifestyle and the perception that people have of us allows me to live well below my means. I tell the young military members that every promotion is an opportunity to SAVE more not SPEND more. No one cares that I drive a 1999 Honda, no one cares that I don’t live in a 500k house or wear expensive clothing. I shop at thrift stores – RICH people often donate to them, so you can let them pay the upfront cost of expensive items. A coworker of mine got a $400 suit for $2.00 at a thrift store. I often ask clients how much they spent TODAY. Most can tell me to the penny “$15.34”. When I ask what they spent yesterday I usually get a ballpark figure “about $20”. If I ask what they spent in a week – too many times a get a shoulder shrug. Saving additional money each month is easier than you may imagine and without changing your “quality of life”. For example: many people I counsel drink a few energy drinks a day that cost about $2.50 each. Cutting back one a day can save them about $900 a year. They would never know that or understand it without some sort of budget. If you have not read the book yet or plan on rereading it, ask yourself one question before you start. If the answer is to earn money to buy great things, this book may not be for you. If you say to someday become independently wealthy, then start reading today. Hi, again all these are ‘philosophies’ of managing money well, not hard & fast rules. Do we save every penny & invest to produce passive income, not enjoying life’s little luxuries along the way? Or do we spend what we earn as we don’t know what’s around the corner? One can save the pounds but spend the pennies. I eat out now & again, never order a starter & rarely order more than a pint when I’m out. Find out what your into/hobbies/like and as long as it’s not an extortionate habit or hobby, enjoy a little of it occasionally to remind you of why you work so hard! If you just save & invest life WILL pass you by! Just my opinion of course. This is right when it comes to saving. If you spend less than you earn and live under your means you are going to get rich at the end. Regards from Dominican Repubic. As a poor person (annual gross <$15k with student loan debt), I have noticed a tendency of personal finance writers to casually assume their audience is within shouting distance of a mainstream American income. The authors' PAW / UAW net worth formula shows this bias; not only is their formula inadequate for those with the shortest earning streams (e.g. the youngest, who also are likely to be at or near the low point of their lifetime earnings curve), it is inadequate for the lowest earners, since low incomes (say, $15k) are generally considered insufficient to allow saving, investment, and wealth accumulation – not to mention enjoying appreciation potential by owning a home. The most important lesson in this book is to note that millionaires don’t over spend on their homes, cars or watches! how much money does one need to retire? How about a ballpark number! Agreed! I drive a 20-year-old truck with 222,000 miles on it that I bought for $3,400 in 2010. A friend of mine has 2 leased BMWs. The result is that I was able to buy a home and rental property (both with a 15-year mortgages) and he’s renting a house. A great point. A 15-year loan is the way to go. I’m impressed by how much equity is gained with each payment. For example, in 2007 I bought a $113k property with a 30-year note. Each payment took $100 off the principle. When I re-fi’d to a 15-year each payment too over $500 off! Depends on your cost of living now and into retirement. Take the intended age you want to retire, your income for those retirement years, then subtract any expenses you have. That will give you the ballpark number. It’s different for everyone as we all have different plans and expenses/ideas for retirement. Never take advice from a millionaire – they simply have not accumulated enough money to give advice. One of the biggest mistakes of my life was looking to the frugal millionaires as my role models for finance. A million dollars is not a lot of money and the advice here is outdated. A million dollars is just enough money to be more worried about money. If you have to worry about what you drive and save on latte’s you aren’t rich you are scared. The numbers are outdated. A million is not what it used to be. The concepts in the book, however, are not.